One year ago this week, Zach and I moved from Atlanta to Athens (don’t stalk me, internet). We were newly pregnant, starting new jobs, and looking forward to our Athens life. Since we could afford it this time around, we hired movers. It was fantastic! We rented a U-Haul, and the movers showed up to our house bright and early in the morning, ready to move all of our stuff for us. By mid-morning, the move was going great, and I drove over to Little Five for coffee and bagels for our crew. There was an unreasonable amount of traffic and other goings-on for Saturday morning, so I didn’t answer my phone as I drove. It had wrung about three times, so I picked it up as soon as I pulled into the parking lot of the coffee shop, wondering why on earth I was so popular. Turns out all the calls were from Zach. Sure that something was wrong, I called him back immediately. I was right. He sounded frantic and told me that our littlest cat Dot had been near the front of the house when one of the movers scared her. She became frightened and ran straight out the open front door, across two of our neighbors’ yards. He went after her, but hadn’t found her. She had been gone for about 20 minutes, give or take, and he was still exploring the yards around our house for our tiny kitten. Here’s a little relevant background on Dot. 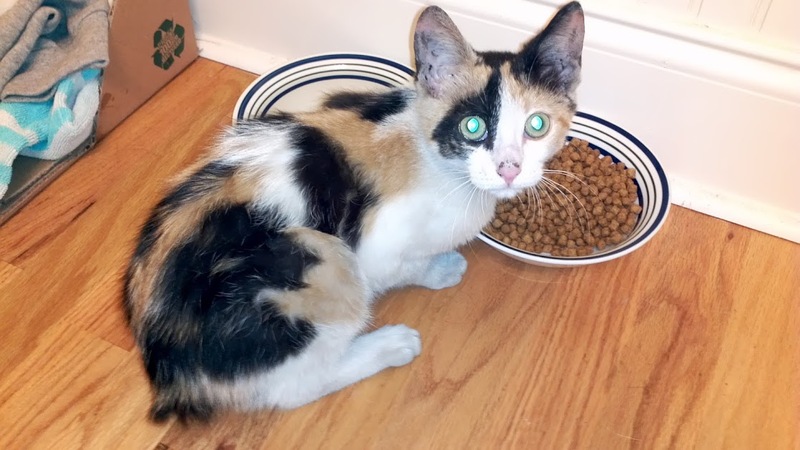 We had found her in a warehouse parking lot in southwest Atlanta about a year prior. Zach was part of a makerspace, and I was picking him up since we only had one car at the time. I was there early one night with Krystal cheeseburgers (we weren’t vegan then, obvs) to keep me company. As I was waiting, I saw a tiny little cat darting between cars. This was no place for a kitten! The parking lot was busy, and I was worried she was going to get hit. I stepped out and called to her. She seemed interested but wouldn’t let me get near her. I ripped up my cheeseburgers and made a line to myself. She came close, but she was still too far away for me to grab her. Zach found me when his meeting finished, and we worked together to lure her to us without success for about an hour. I hated to leave, but nothing was working, so we left her a supply of water and what remained of the cheeseburgers. I was sure we’d never see her again. But we were meant to have this cat! I was picking Zach up two nights later and again arrived early with cheeseburgers (Wendy’s this time; side note: I’m embarrassed by my then-diet and would like to assert that I eat tons of veggies now and don’t even eat meat anymore.). Dot stuck her head out from underneath the car right next to me and I climbed out of my car to sit across from her. I offered her pieces of my cheeseburger, and this time she came to my lap! She purred and let me scratch her and seemed generally happy to see me. Zach came out about that time, and I motioned for him to get in the car and be ready for me to hand this little cat over. He hopped in the passenger seat and made sure all doors and windows were closed except mine. I slowly stood, letting Dot rub my legs the whole time. When she seemed least suspicious, I bent down, scratched her head, and picked her up by her scruff. She didn’t go limp like most kittens. I got her into the car, but she jumped all over Zach, angry and confused. I grabbed an old sweater from the backseat, and we wrapped her up and headed for home. She was full of fleas, completely malnourished and dehydrated, and in dire need of a bath, but she was safe. We cleaned her up, rehabilitated her, and she’s been a happy part of our family ever since. All cleaned up and ready to be a house cat. When Zach told me she was gone, I was devastated. Our cats are indoor only. They have claws, but they don’t have any hunting or survival skills. I rushed home. We had joked before that if Dot ever got out we’d never find her because she was a little ninja. When I got home, Zach and I searched high and low for hours. The movers packed up the U-Haul, but we cancelled the actual move to stay en extra night to search for Dot. We turned all the lights off in our house that night and left the door open, hoping she’d wander back in. She didn’t. We commenced with the move the next morning, but made a plan to find our lost kitten. For the next three weeks, we became pet detectives. I called wildlife trapping experts, a group specializing in finding lost pets, and trap-neuter-return programs learning how to catch skittish animals. We were living and working in Athens, but we drove back to Atlanta every night and sometimes twice a day on weekends. I had taken a week off work for a beach trip that we ended up cancelling so I could use those days to search. It was raining buckets (this was during the monsoon time in Georgia last year). We put out humane traps, positioned wildlife cameras in areas we thought she might be spotted, and set bait everywhere. We left trails of food to our humane traps and sprayed tuna juice in the areas near the traps to lure her in. Our fantastic Atlanta neighbors helped in the search, and we posted big, colored flyers everywhere. We caught every neighborhood stray, countless opossums, a few grumpy raccoons, and even two squirrels and one mouse. There was no sign of Dot anywhere. Three weeks and one day after she disappeared, losing hope, we checked our traps to find they were all filled with opossums. Hoping that if we moved them to the other end of the neighborhood they’d leave our traps alone, we loaded them into the back of our car and set off. As we were driving away from our house, we started talking about winding down the Dot hunt. We were so tired and sad, and the constant back and forth to Atlanta was draining our bank account and our energy. Just as we were about to decide to scale our efforts back, I noticed a flash in the woods to our left. I didn’t know what it was for sure, but I told Zach to slow down and put the Prius in electric mode. If it was Dot, I didn’t want to scare her with car sounds. I motioned to the woods and whispered to Zach that I saw something. All of a sudden, a little calico face peeked out! 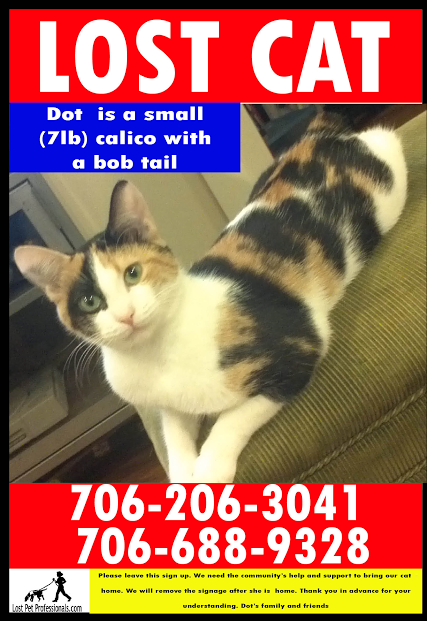 Unsure if it was Dot or another calico, I opened my door and crept around the car. 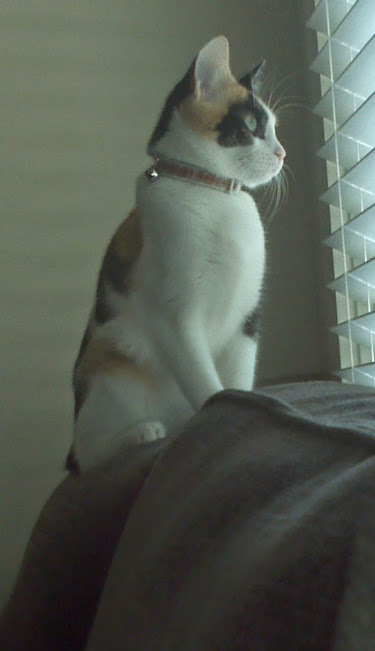 This cat had on Dot’s little pink collar and tags. It was her! I grabbed a bunch of cat food and the cat carrier and moved toward the woods. When I got close to Dot, she hopped back several feet into the brush, but I could still see her. I camped out in the green space on the side of the road after I made a little trail of cat food from her to me. I called her name, talked to her, and made little meows in her direction. She called back to me. Gradually, she started to move toward me. Zach remained with the opossums and after realizing this was going to take a while, left to release them. I sat with Dot for about 45 minutes before she got anywhere close to me. It was another 20 before I was actually able to touch her. She was hungry, but she was also scared and semi-feral. Zach had returned and was observing from afar so as not to overwhelm her. When I finally couldn’t wait anymore, I went to grab Dot’s scruff as I had the first time we met. She lost her mind. Immediately realizing I was going to lose her, I wrapped her in a bear hug and laid down over her in the mud. Zach saw that I was struggling and came over to open the cat carrier. Dot and I wrestled for a minute or two, during which time she stuck one of her claws through one side of my finger and out the other (it was numb for over a month) and bit down to the bone on my dominant hand (I couldn’t write for several days so my paper charting from this week is atrocious). I never, ever let her go. I knew if I didn’t get her this time, we’d probably never get a chance again. I finally got a good hold on her and got her into the cat carrier Zach was holding open for me. We put her in the car, and she was rescued! Blood was everywhere. I was worried because I thought Dot was hurt, but then we quickly realized it was my blood. After taking a minute to calm down, I discovered that my hands felt like they were ON FIRE. We stopped by our former neighbor’s house and got some water and first aid for me. It was pretty clear by the bleeding and swelling that I probably needed to go the emergency room. We had no idea what Dot had been exposed to, and I was pregnant. However, I had no intention of going anywhere until Dot was safe in our house. We drove back to Athens and set Dot up in quarantine in our guest bath until she could see a vet, then we headed to the ER. I was fine and only needed to have my wounds thoroughly cleaned along with a course of serious (pregnancy-safe) antibiotics. Over the next few days, Dot returned to her old self. She had a touch of pancreatitis and needed to spend a night in the animal hospital, but other than that was totally fine. I gave her a developmental bath like I used to use for NICU babies, and her fur fluffed right back up. Within a few weeks, it was as if she had never left. Getting rehydrated to help treat pancreatitis resulted in the most adorable bandage. This is one of my best stories, and I love telling people about. 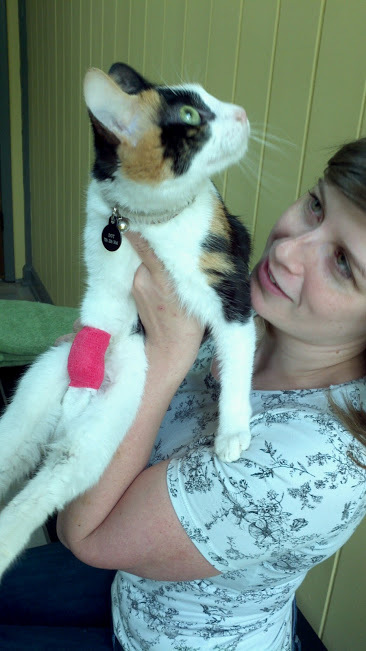 In person is even better because I still have the scar where Dot looped her claw through my finger tip to show off. I love that it makes Zach and I sound like cat-rescuing heroes, even though it also makes us sound kind of obsessed.